I had a life-changing opportunity volunteering at a leprosy survivor village in Chengdu, China. Leprosy is a chronic infection causing nerve damage and muscle weakness leading to disfigurement and deformities. Due to leprosy being airborne, patients are isolated in villages far away from large cities. However, these villages also have perfectly healthy children that have never seen life beyond their village because of the stigma around leprosy. 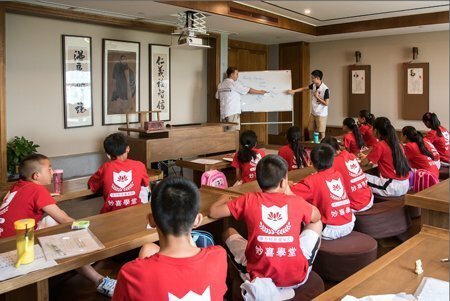 Maoxi School (located inside New Century Global Center, world’s largest building in terms of floor area) allowed 39 of these kids to come to Chengdu and study English, arts, sign language, etc. My USAC friends and I got to take a little part of our week after classes to teach and interact with these kids. But they definitely ended up teaching us more than we could have taught them. These kids were funny, enthusiastic, and quick learners. One of my favorite memories was when a group of students asked if I could teach them to sing “that one song from Fast and Furious 7”. It took me a while to figure out they were referring to See You Again-Wiz Khalifa ft. Charlie Puth. By the end of their summer program, I attended their graduation and there was not a single dry eye on that stage and it was at that moment that I came to a full realization of how much this all really meant to them. Going abroad, I knew that I wanted to utilize and make the most out of my time in China and get the full local experience. I never expected to get this immersed with China’s community and I am forever humbled and grateful for this experience!